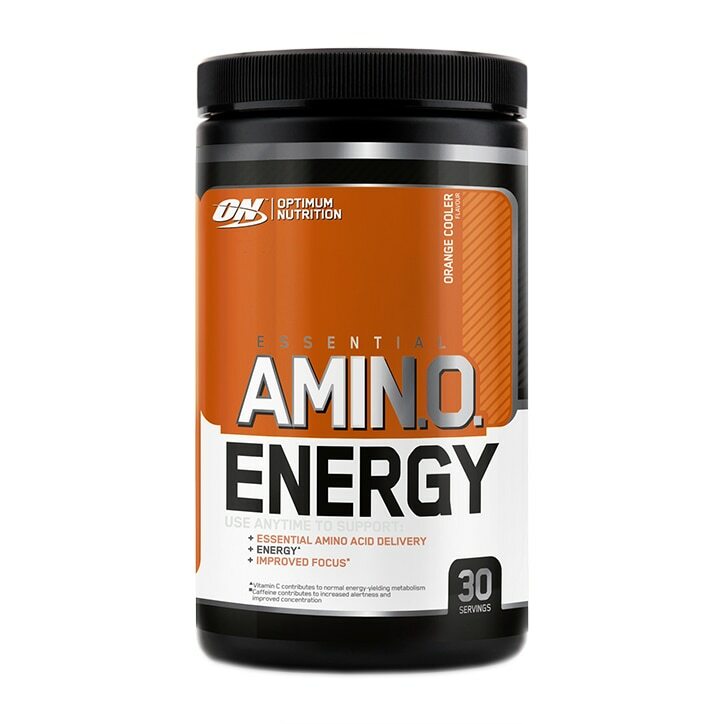 Optimum Nutrition's Essential Amino Energy Powder combines an optimal ratio of rapidly absorbed free form amino acids (including BCAAs and arginine), as well as beta alanine and N.O.- boosting ingredients to help you reach your next level. At just 29 calories per serving, Optimum Nutrition Amino Energy makes a big impression without denting your diet. Amino Energy supports recovery before, during & after exercise, and has caffeine from natural sources. Mix up Essential Amino Energy by itself with cold water or stack it with your favourite powdered supplements. Mix two scoops for a mild energy level, four scoops for intense energy level, and 6 scoops for intense energy level. Add two level scoops (9g) to 330ml of cold water and mix. Recommended consumption of one serving per day, either before, during or after your workout. For Post-Workout Amino Support: As least 4 hours after initial pre-workout dose, take 2-4 scoops after training. Do not exceed 10 scoops per day. Amino Acid Blend (Micronized Taurine, Micronized L-Glutamine, Micronized L-Arginine, Micronized L-Leucine, CarnoSyn, Beta-Alanine, Micronized Citrulline, Micronized L-Isoleucine, Micronized L-Valine, Micronized L-Tyrosine, Micronized LHistidine, Micronized L-Lysine, Micronized L-Phenylalanine, Micronized L-Threonine, Micronized L-Methionine_ Energy Blend )Caffeine (from Green Tea)‡, Green Tea Extract (Camellia sinensis)(leaf)(standardized for EGCG), Green Coffee Extract Citric Acid, Natural and Artificial Flavours, Malic Acid, Tartaric Acid, Silicon Dioxide, Calcium Silicate, Sucralose, Gum Blend (Cellulose Gum, Xanthan Gum, Carrageenan), Inulin, Lecithin (Soy), FD&C Yellow no.5 & 6, FD&C Red no.40. Contains Soy (Lecithin).Check with a qualified health care professional before taking this product if you are pregnant or nursing a baby, under 18 years of age, have any known or suspected medical conditions, and/or if you are taking any prescription or OTC medications. Optimum Nutrition Amino Energy Powder Orange is rated 4.8 out of 5 by 6.